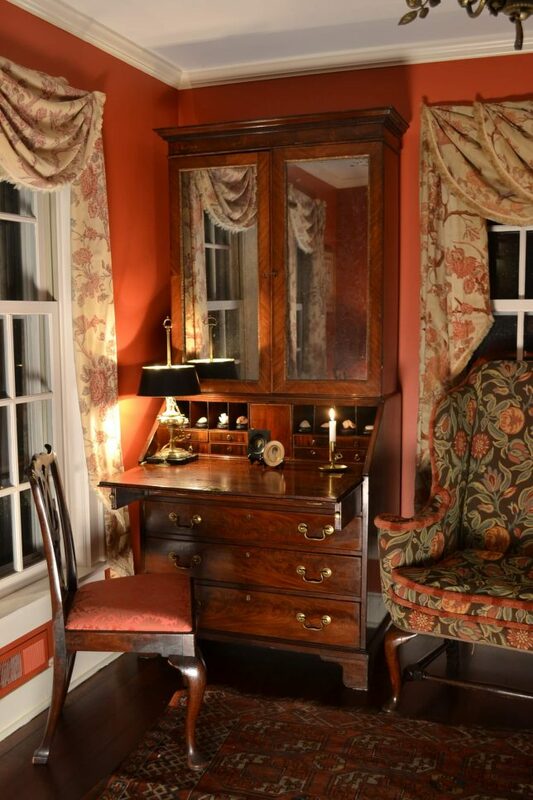 A great desk is the focal point of the room. Elegant, useful, and comfortable to use would describe this bureau. Your laptop will fit easily with plenty of room in the drawers and in the bookcase above for accessories and other essentials. The rich, warm mahogany, with beautiful graining, is the reason that this wood has been the most sought after for centuries. Further, the 18th century was an era where the best logs were available for skilled makers. The deep molded cove cornice above rests on a frieze of crotch mahogany over mirrored doors with acanthus rims bound with diagonal veneers. In the lower case, a crotch grained slant lid opens to reveal an interior of pigeon holes over small drawers, with a central prospect door. Each small drawer has striped veneers with inlaid rims. The lower boldly grained drawers have brass bail pulls over the original bracket feet. Importantly, the case is a most desirable 36″ width. Height is 63″. $3350.